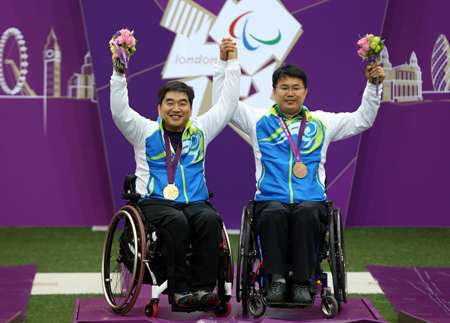 Korean shooter Park Sea-kyun, left, and Lee Ju-hee, right, celebrate after winning Paralympic gold and bronze medals, respectively, in the men’s P1-10-meter air pistol at the Royal Artillery Barracks in London, Thursday. Korean shooter Park Sea-kyun collected the country’s first gold medal of the 2012 London Paralympics in the men’s P1-10-meter air pistol at the Royal Artillery Barracks on Thursday. Turkey’s Korhan Yamac gained on the Korean as the shooters neared the end of their 10 turns. With only one shot left each, Park was just 0.5 point ahead on 654.9. Park hit 9.8 but Yamac’s 10.3 leveled the scores to force a sudden-death shoot off where Park’s 10.8 beat out the Turk’s 9.9. A perfect score is 10.9. Getting off to a decent start by hitting inside the 10-point mark twice, Park took the lead. Yamac then threatened Park’s dream to win Korea’s first gold at the Paralympics. Hitting the bull’s-eye with his 11th bullet in the shoot off put an end to Yamac’s bold challenge. “When I shot the 10.8, I felt that I certainly would win, knowing that Jin Jong-oh also won gold with his 10.8-point shot previously,” Park said. Korean Jin won his first London Olympic gold in the 10-meter air pistol after a tight finish and later added another victory in the 50-meter pistol. Compatriot Lee Ju-hee took the bronze in the event, while Park will have another chance to win gold Monday in the mixed 25-meter pistol SH1. Korea has 149 athletes and officials taking part in 13 sports at the Paralympics with an aim to win 10 golds. 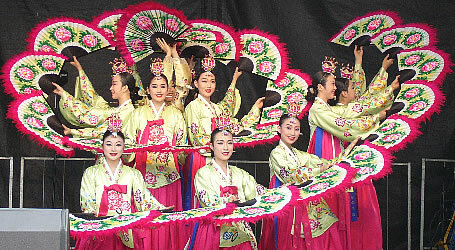 Four years ago in Beijing Team Korea took home 10 gold, eight silver and 13 bronze medals. The country is pinning its hopes on shooting, archery and table tennis. North Korea will make its maiden appearance at the event when swimmer Rum Ju-song competes in the men’s 50-meter freestyle. He is the only North Korean athlete at the Paralympic Games. How high are you going to fly Psy Oppa ?